Love is warm, hate is cold…energetically speaking. So what do you want to be this week? Warm or cold? 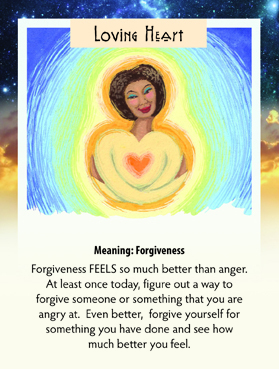 The forgiveness could be toward yourself or someone else. I could be that you just don’t like the state of the world right now. So try to focus on what you love or like about the person or event. If we focus on things like war, we just give it more energy…believe it or not. So when you find yourself upset at someone, yourself, or something this week, shift your thoughts to something or someone that you love…perhaps a different person or event, but you will feel much better for it. Share your experiences with the rest of us on this blog!